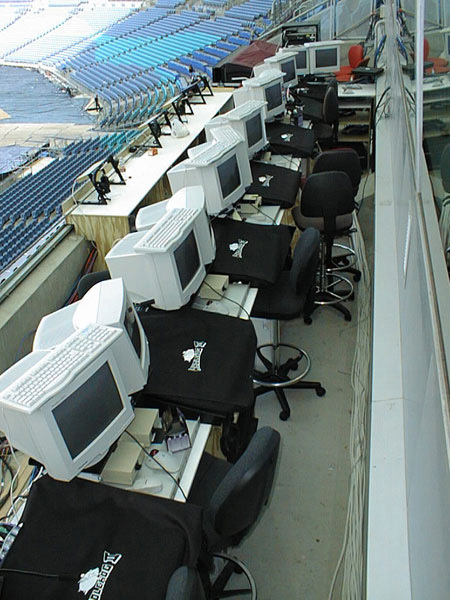 Larry Estrin and Pete Erskine were tasked with designing the comm system and managing it for the Ceremonies opening and closing Olympics. Clearcom Matrix Plus was selected as the preferred system and The PA People, a local Clear-Com dealer was chosen to provide the systems. For the first time it was decided to use in ear monitors for the mass cast to insure that they were dancing in rhythm and to give them timely cues during the event. The receivers were crude analog FM devices which the venue already owned for assisted listening. Our crack crew of terrific volunteers spent many long nights tuning the 8000 receivers which had analog tuning dials. During a rehearsal we tried them out for the first time on 3000 of the tap dancers. While waiting for the rehearsal to start the audio mixer rolled the tape dead pot and amazingly the 3000 dancers all began to dance to their own music which we couldn't hear. IT WORKED! Larry Estrin at his command post during the show. Lighting consoles at night using four Clear-Com ICS-92 intercom stations. Pete standing next to the lighting fiber distribution system. Pete Erskine relaxes as the show takes care of its self. Lighting consoles using four Clear-Com ICS-92 intercom stations. Rowan Goss terminating some of the 267 fiber circuits which Best Audio connected.